These days Chinese women are crazy about cosmetics. It seems they can't get enough of them, spending an average of 10 to 15 percent of their income on cosmetics and skin care. Urban women use an average of 2.2 products every morning. Growth rates for the cosmetic industry are in the double digits. In the Mao era, women either wore no make-up or wore cheap, thick make up that covered up their nice skin. Some women rubbed their lips with sandpaper to create the illusion they were wearing lipstick. Even today most Chinese women over 45 have never used mascara. 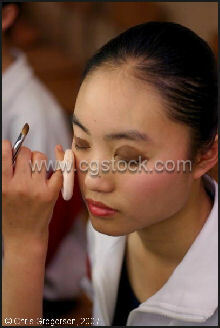 Make up is used by mainly young woman. Women have traditionally been taught about make up by their mothers or grandmothers but these days many older women grew up when wearing make up was discouraged. One survey found that only 3 percent of women over 45 wear lipstick, compared ro 50 percent in Europe. There are still many people who link wearing make up up with prostitution and bad girls. Chinese women are not big on perfumes. They prefer skin care and beauty products, favor neutral colors and eschew make up or hair styles regarded as aggressive. According to research by L’Oreal women in China are concerned about the radiance of their skin and prefer nourishing lotions that protect their skin from the skin-drying winters. In China, Wal-Mart sells moisturizers made with sheep placenta which is purported to reduce wrinkles; spas offer seaweed wraps; and breast implants have names like Magic Peach and Dream Xcell. Nine SKII products made by Proctor and Gamble were found to contain chromium and neodymium---two metals whose use in cosmetics is banned in China. Chromium is carcinogenic and can cause eczema. Neodymium is used in magnets and can cause eye and skin irritation. A woman in the Anhui Province of Central China nearly died when she was attacked by thousands of bees that were attracted to her facial creme. There are between 3,500 and 4,000 cosmetic manufacturers in China. The value of the Chinese cosmetic industry was estimated to be somewhere between $4.5 billion and $6 billion in 2004 and is expected to reach $8 billion in 2007. As of 2005, skin products accounted for about 60 percent of sales, make up 30 percent and fragrance 10 percent. The Natural Beauty Group, a company that specializes in making cosmetics for Chinese women, was set up in the early 1990s by the Taiwanese entrepreneur Tsai Yen-ping. By 2001, it had more than 1,000 stores and 10,000 employees. Even though only 500 of the 3,500 cosmetics manufacturers in China foreign owned they control an 80 percent share of the market. L’Oreal of France, Procter and Gamble and Avon of the United States, Shiseido of Japan all have large market shares in China and are all enjoying healthy growth in China. Chanel and Christian Dior are also doing well. Avon is the No. 2 cosmetic seller in China. It sold $157 million worth of products in 2003 and expected to sell $500 million by 2007. Avon has had to be flexible to prosper. It began by using its traditional direct selling strategy but when door-to-door sales were banned in 1998 because of concerns about pyramid schemes, Avon became a retailer. As of 2004, there 6,000 Avon Beauty Boutiques in China, many of them run by former door-to-door saleswomen. Avon is strong outside the major urban areas. Mary Kay has over 200,000 women selling cosmetics in China and has posted sales increases of 20 percent a year. In China the company is regarded as a premium brand. Proctor & Gamble arrived in China in 1988 through a joint venture with the Hong Kong-based company Hutchinson Whampoa. The Japanese cosmetics giant Shiseido is marketing their products aggressively in China. Shiseido produces Urara which is only available in China and Za brands which are sold throughout Asia. Shiseido entered China in 1981, making it one of the first cosmetics company to enter the Chinese market. It had ¥60 billion in sales and 2,500 retailers in 2007. Shiseido has two factories: one in Shanghai and one in Beijing.. In November 2005, it opened a large research facility outside Beijing. Researchers plan to examine skin and hair from women all over China and develop products to best suit local lifestyles and weather. In 2007, Shiseido doubled the production capacity size of the plant in Shanghai to keep up with demand. L’ Oreal entered China in 1996 and is now the No. 1 cosmetics seller in China. In 2006, it earned $500 million, up from $207 million in 2003, which in turn was an increase of 69 percent from the previous year. L’Oreal markets 16 brands in China, including Maybelline, Loreal Paris, Lacome and Shu Uemura. L’Oreal’s marketing director in China told the International Herald Tribune, “Our strategy is to be everywhere." Maybelline is sold in 12,873 stores in 646 Chinese cities. In 2006, L’oreal purchased Mininurse, which is distributed in 250,000 outlets. In September 2006 L’Oreal opened a research center in Shanghai. Researchers there study things like the way women wash their face and apply cosmetics and the diameter of their hair follicles. To develop cosmetics and hair care products designed especially for Chinese women the company is assembling “atlases” of Chinese women’s skin. The company, which posted profit declines in 2011 and 2012, has been making acquisitions and introducing new products as sales in some of its larger brands slow.“Revlon was unable to gain scale and relevance in the important Chinese beauty market,” Connie Maneaty, an analyst at BMO Capital Markets in New York, wrote in a note. The market for men's cosmetics in China is growing very fast. Among the items for sale are skin lotions, whitening agents, face cleansing cream, deodorant spray, mud masks and anti-aging beauty creams made especially for them. Shiseido offers the Handsome Man line of products, which includes mousse, cologne, skin moisturizers, facial cleaning lotions and scented antiperspirant lotion. Cosmetics companies have found that products for men sell best when the are sold with women’s cosmetics. Marketing researchers have found that men often are too embarrassed to buy the products themselves but will use them if their wives or girlfriends buy them for them. And while crowds from the mainland may hit Hong Kong's shopping malls like starving locusts, Mr Cheng believes that they are doing so with a sharper eye than the tills alone suggest. In Mr Cheng's view, the hunger for luxury goods by China is a quest for authenticity. "Chinese women are turning to diamonds for many complicated reasons. Unlike an iPhone, which they buy knowing it will be out of date in six months' time, with jewellery they are looking for something that represents investment and value. These women are sophisticated, educated and have travelled. They know what investment is and they know how to buy in a way that preserves value. Diamonds for Chinese women are also a symbol of status. It is giving face. When you wear a diamond - one, two or three carat - it immediately translates as status in front of your peers, clients and stakeholders." The same market that can be enchanted by a logo on the back of a grimy bus is developing a Japanese-style obsession with cuteness. One new product that Mr Cheng believes could become a favourite in the company gift-giving circuit is a solid gold Winnie the Pooh. He fought hard to gain the rights from Disney and has Mickey and Minnie firmly in his sights as Shanghai begins work on mainland China's first Disneyland. "The problem is that not all Disney characters are really cute,” he points out. “I mean, you can't really have the Little Mermaid. Would we look at Hello Kitty? Probably." Even by the expansive norms of corporate China, these are big ambitions. The company has a scattering of stores in Asia but 1,500 points of sale in Greater China. Its revenues are 50 per cent bigger than those of Tiffany, the next-largest pure-play jeweller in the world, and eclipse global sales of the jewellery segments of Richemont. Possibly the most disturbing element for foreign observers - once they have overcome the fact that Chow Tai Fook is probably the biggest brand they have never heard of - is that its fame and prospects are entirely a Chinese affair. All of Mr Cheng's plans lie in China's second, third and fourth-tier cities. Many preach the eastward shift of the global economy, but few practice it so purely.